Looking at the overall effectiveness of the Devon community in improving health, we can consider trend information and compare ourselves with similar geographical communities. 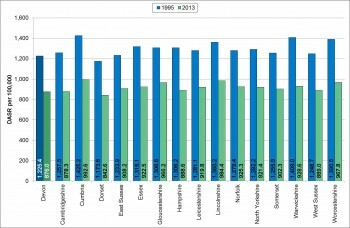 Figure 6.01 illustrates overall trends in mortality rates over time in Devon compared with the South West region and with England. In general, the picture is positive, but we know that the different socio- economic and other groups here experience considerable variation, so this merely represents an average. Within the overall deaths, there is a subset of these from conditions which are considered preventable. The trend in this area is important because it gives an indication of how well we are using public health interventions, or early interventions, to prevent disease. Figure 6.02 shows a year-on-year reduction which is a positive finding. Figure 6.03 shows how death rates have changed over time for those conditions where the health service could have an impact. 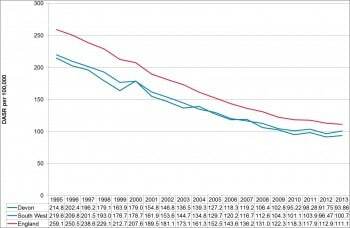 This shows a real change since 1995 with a very steep reduction in death rate. 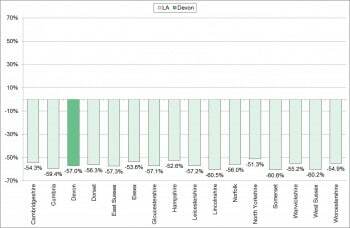 We should remember that Figure 5.06 in the last chapter showed that this improvement has been greatest for the better-off people in Devon, and least for the poorest, an indication of the inverse care law in practice: those people who have the greatest need for health services are the least likely to access it[Hart JT. The Inverse Care Law. Lancet 1971; i: 405-12.]. The NHS must be asked to demonstrate how it is fulfilling its statutory duty to reduce health inequality. 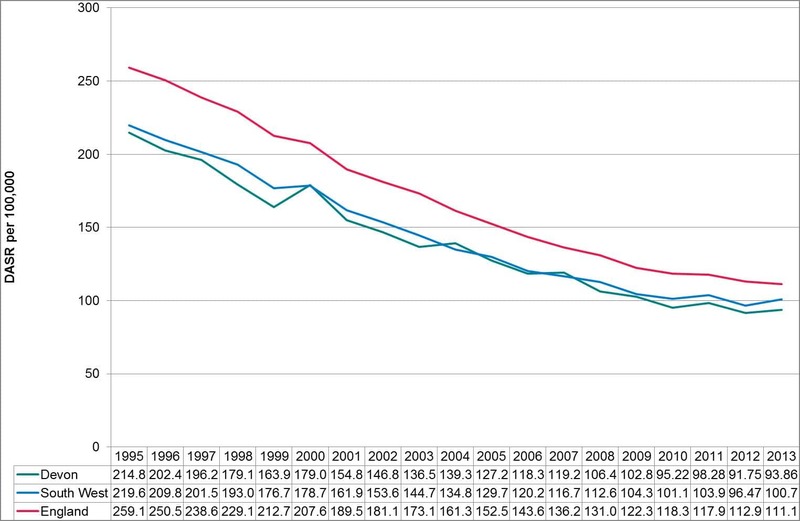 Figure 6.01: Trends in mortality rates, Devon, 1995 to 2013. Source: Compendium of Population Health Indicators, Health and Social Care Information Centre, 2015. Figure 6.02: Trends in mortality rates from preventable conditions, Devon, 2001-03 to 2011-13. 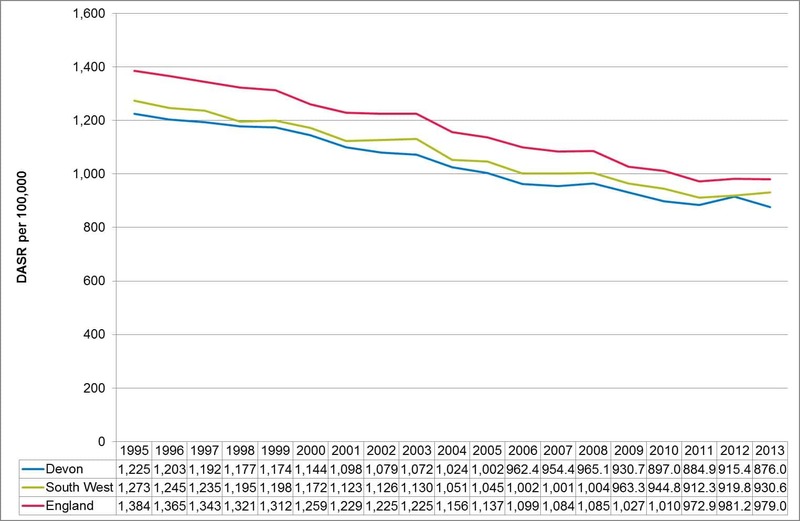 Figure 6.03: Trends in mortality rates from conditions considered amenable to healthcare, Devon, 1995 to 2013. When we consider similar geographical communities, the pattern of each of the three graphs shows a different picture (Figures 6.04, 6.05 and 6.06). 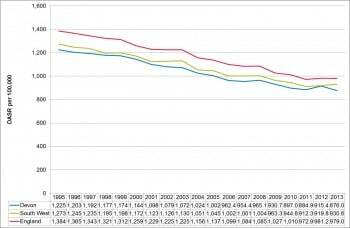 Overall mortality rates (Figure 6.04) shows good progress but not assignificant a reduction between 1995 and 2012 as seen in Cumbria, Hampshire, Warwickshire or Worcestershire. 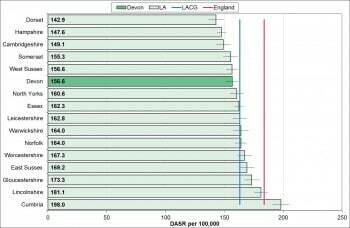 And while Devon’s performance on deaths from preventable conditions is good, Dorset, Hampshire and Cambridgeshire are significantly better (Figure 6.05). 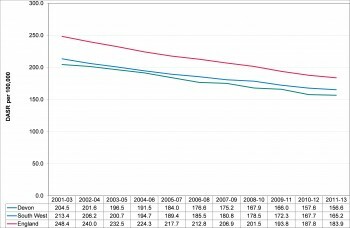 On healthcare preventable conditions, where healthcare interventions available to the population are broadly similar (as we have a National Health Service) there is a variation in reduction in mortality from 51.3% to 60.5%, with Devon’s reduction equivalent to Dorset and Gloucestershire (Figure 6.06). These graphs indicate that the health of our most well-off populations is very good but to improve overall health further, the focus must be on those whose health is worst. Figure 6.04: Change in mortality rates, Devon versus local authority comparator group, 1995 to 2013. Figure 6.05: Trends in mortality rates from preventable conditions, Devon versus local authority comparator group, 2001-03 to 2011-13. 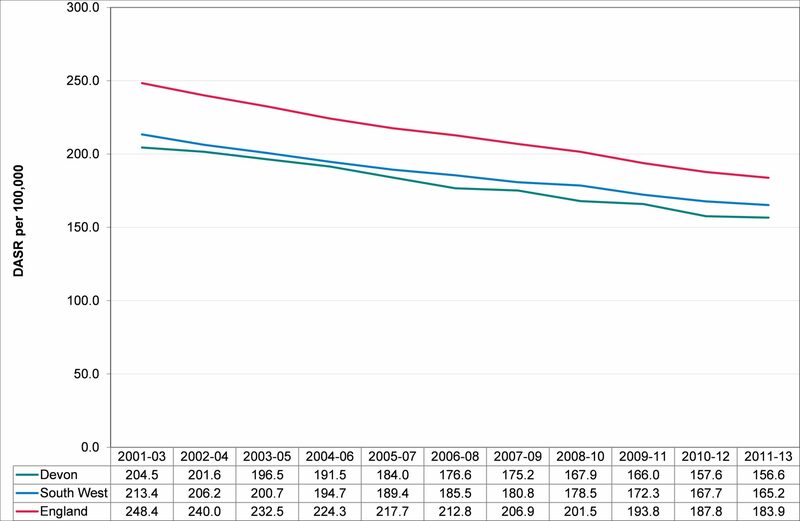 Figure 6.06: Percentage change in mortality rates from conditions considered amenable to healthcare, Devon versus local authority comparator group, 1995 to 2013. Given the importance of socio-economic deprivation on the impact of health improvement activities, how has this changed over the last few years? Figure 6.07 shows where the increases and decreases have occurred across Devon. This is important as it gives a clue as to where poor health will be found. 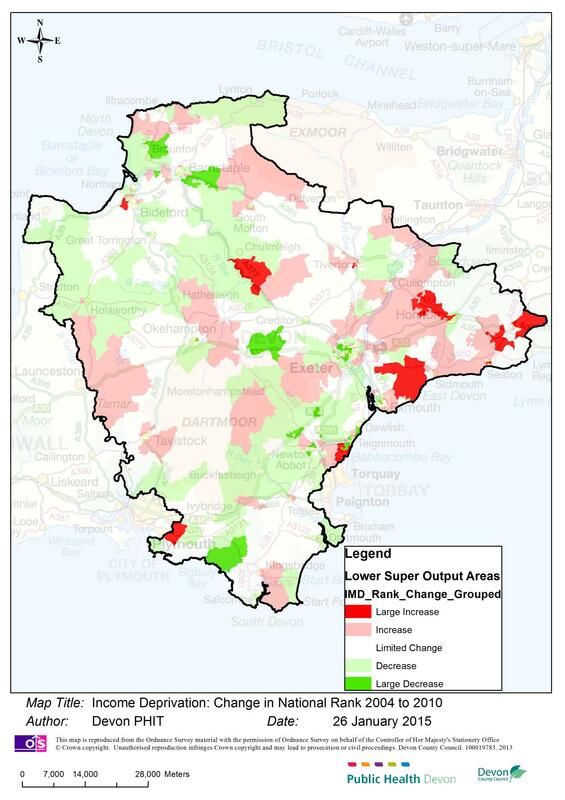 Of particular concern is the pattern in East Devon. 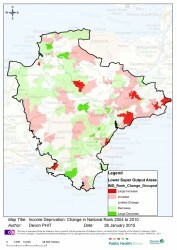 Figure 6.07: Map of Devon showing change in socio-economic deprivation, 2004-2010. R6.1 The NHS must make explicit its strategies for reducing health inequality, and be able to provide evidence of achieving reductions. R6.2 More insight is required into the reasons why there is a persistent pattern of later presentation of, and treatment for, cardiovascular, cancer and pulmonary disease in Ilfracombe. R6.3 There should be an active targeting of preventive interventions for people living in the most socio-economically deprived areas of Devon, and the impact of these should be measured by improvements in life expectancy, and reductions in emergency admissions and premature death rates for preventable or treatable conditions.